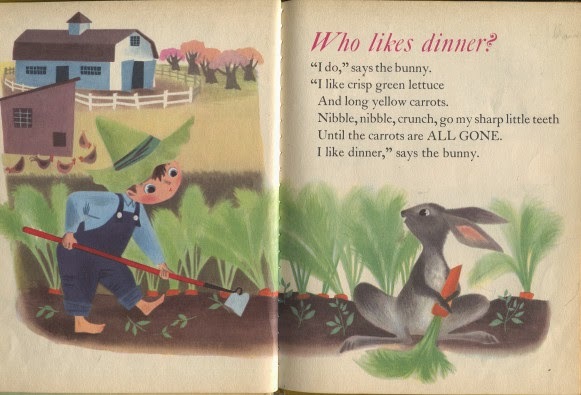 As a young boy goes about his farmyard chores, he learns what each animal prefers for dinner, including his own preferences. "I do," says the kitten. "I like a saucer of milk to dip my whiskers in. 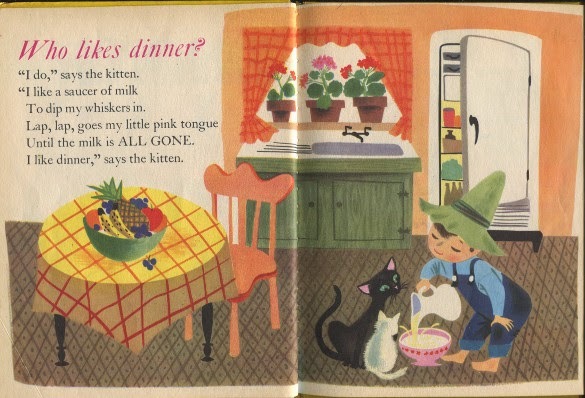 Lap, lap, goes my little pink tongue until the milk is all gone. 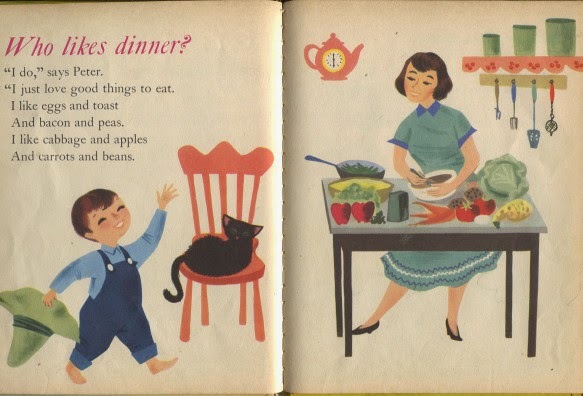 I like dinner," says the kitten. "I do, " says the puppy. "I like crunchy brown biscuits, and a big bone to chew. Crickety, crick, go my sharp little teeth until the biscuit is all gone. I like dinner," says the puppy. "I do," says the pig. "I like sour milk and corn that's juicy and tasty. Slurp, slurp, I sip and I swallow until the milk is all gone. 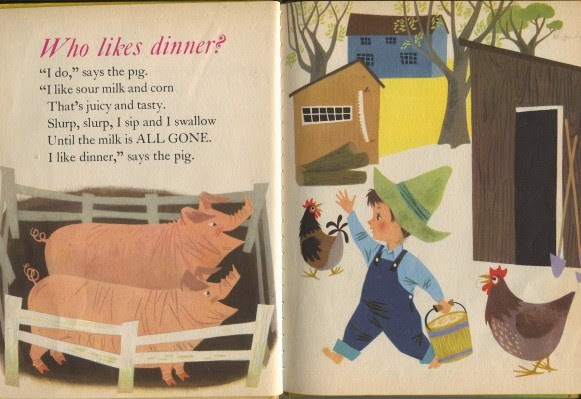 I like dinner," says the pig. "I do," says the bunny. "I like crisp green lettuce and long yellow carrots. Nibble, nibble, crunch, go my sharp little teeth until the carrots are all gone. 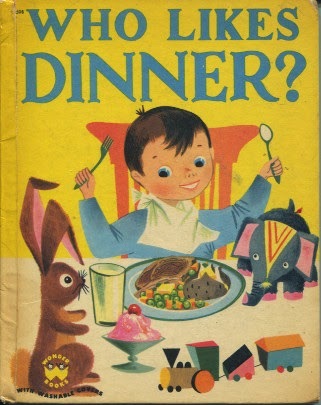 I like dinner," says the bunny. "I do," says the colt. "I like a pailful of oats, and some sweet green grass. I nibble, nibble, nibble, until the oats are all gone. 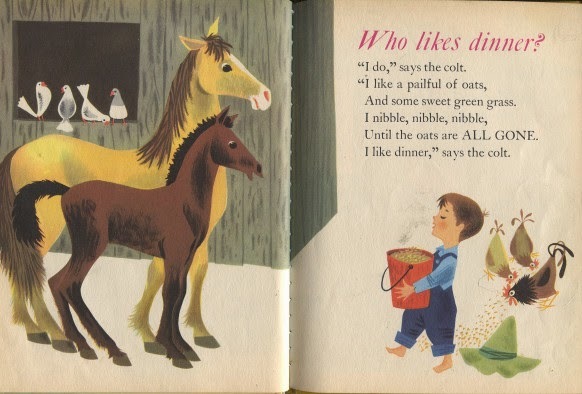 I like dinner," says the colt. "We do," say the chicks. "We like yellow corn and meal. 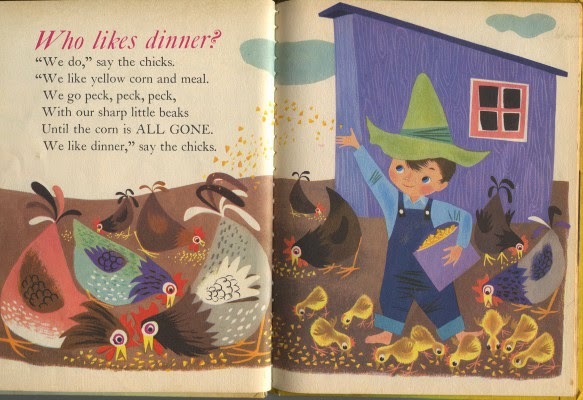 We go peck, peck, pek, with our sharp little beaks until the corn is all gone. We like dinner," say the chicks. "I do," says the squirrel. "I like fat, hard nuts to crack in my teeth. I munch and I crunch until the nuts are all gone. 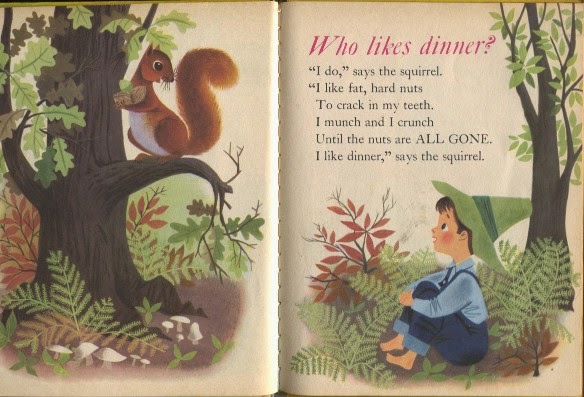 I like dinner," says the squirrel. "I do," says Peter. "I just love good things to eat. I like eggs and toast and bacon and peas. I like cabbage and apples and carrots and beans. But I don't like grass and I don't like bones and don't give me worms or old sticks and stones. 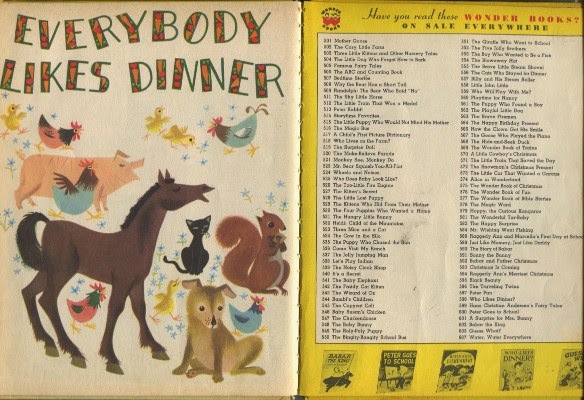 But give me potatoes and gravy and meat--that's my dinner, and I like to EAT!"